DATE: April 17, 2019 Today is Wednesday, April 17th, 2019. I’m Kevin Boyle, with today’s W-V-B-I Community Calendar. Here’s what’s happening on your Emerald Isle … Today, and at least the next few Wednesdays, Talking Threads Quilt Guild will be chatting at Peaine Township hall at 9:30. Across today, there’s a special Charlevoix Chamber event featuring Beaver Island. Chamber President Paul Cole will be there along with others to represent the island. You can head over, too, to help fly the flag. Just ask Paul about it with a call to the Chamber at 2505. Thursday, more Pickleball here at the BIC Center from 9:30 to 11:30. Also, Games Galore form 1 to 4 up in Carol’s Hangout. Thursday evening the library board meets at the library at 7 And the Euchre Board meets at Stoney, also at 7. And, the Discover Beaver Island group―a Chamber project to promote the island―is meeting at Peaine Township Hall at 5. Friday, it’s a half day of school for students at B-I-C-S. Arthritis Foundation Exercise Program is here at the BIC Center from 10 to 11. And, don’t forget, it’s Good Friday. Information on services is on the calendar. Here’s what’s up for your Easter Weekend: Lego Club Saturday at the Library at 1. Self-defense class at Peaine Township hall at 5. At the BIC Center, there’ll be an Easter Egg Hunt sponsored by the AMVETs. More details to come. Also, to great uplifting movies for your Easter Saturday: First, at 4, it’s A Dog’s Way Home. It’s the story of Bella and her adventures growing up, getting lost and finding her own way home. Then, at 7, it’s the Kid Who Would Be King. Have you ever dreamt of finding King Author’s sword? And putting bullies in their place? This great film tells the tale. Lots of action and fun for the whole family. Both films are rated PG and both on the big screen with the big sound in the McDonough’s Market Theater. Concession stand will be open for both movies. Popcorn, pretzels, sweets, Nathan’s hotdogs with chips and pop from the soda fountain. On Sunday, Easter worship services at Holy Cross, the Christian Church and the Lighthouse Fellowship. Details are on the calendar. After church, Community Easter Brunch at Greg Fellowship hall from 11:30 to 1. Great food and great fellowship on a day to be reborn. And, while we are talking about good things to eat, be sure to put the upcoming Shakespeare Spaghetti dinner on your calendar. It’s on the 23rd at school. The B-I-C-S A-P English is putting it on as a dinner fundraiser. All you can eat―again on April 23rd from 5:30 to 7. Your free-will donation will help support their trip to England where they plan to continue their study of Shakespeare with a visit to the Globe Theater, museums and more. Tonight Periods of showers. Patchy fog after 2am. Low around 38. East wind around 15 mph, with gusts as high as 30 mph. Chance of precipitation is 100%. New precipitation amounts between a half and three quarters of an inch possible. Thursday Showers likely, mainly before 8am. Patchy fog before 8am. Otherwise, cloudy, with a high near 46. South wind around 10 mph becoming northwest in the afternoon. Chance of precipitation is 60%. Thursday Night A chance of showers between 8pm and 2am. Cloudy, with a low around 35. North wind around 15 mph, with gusts as high as 30 mph. Chance of precipitation is 30%. Friday Partly sunny, with a high near 48. North wind around 15 mph, with gusts as high as 25 mph. Friday Night Mostly clear, with a low around 33. Looking ahead to the weekend looks, well, awesome: Saturday Sunny, with a high near 54. Saturday Night Mostly clear, with a low around 37. Sunday Mostly sunny, with a high near 50. TRAFFIC: No delays inbound or outbound to the airports, beltway running smoothly. Over all, our roads are in great shape for spring. Be sure to thank the road crew folks next time you see them for that. Still, let’s be careful out there. Especially in the school zone. ON THIS DATE in 1790, American statesman, printer, scientist, and writer Benjamin Franklin dies in Philadelphia at age 84. The phenomenon of electricity fascinated him, and in a dramatic experiment he flew a kite in a thunderstorm to prove that lightning is an electrical discharge. He later invented the lightning rod. Many terms used in discussing electricity, including positive, negative, battery, and conductor, were coined by Franklin in his scientific papers. He was the first American scientist to be highly regarded in European scientific circles. Franklin was a delegate at the Continental Congress. In 1776, he helped draft the Declaration of Independence and in July signed the final document. Ironically, Franklin’s illegitimate son, William Franklin, whom Franklin and his wife had raised, had at the same time emerged as a leader of the Loyalists. In 1776, Congress sent Benjamin Franklin, one of the embattled United States’ most prominent statesmen, to France as a diplomat. Warmly embraced, he succeeded in 1778 in securing two treaties that provided the Americans with significant military and economic aid. In 1781, with French help, the British were defeated. With John Jay and John Adams, Franklin then negotiated the Treaty of Paris with Britain, which was signed in 1783. DID YOU KNOW: In 1923, jockey Frank Hayes won a race at Belmont Park in New York despite being dead ― he suffered a heart attack mid-race, but his body stayed in the saddle until his horse crossed the line for a 20C1 outsider victory. WORD OF THE DAY: lese majesty (LEEZ MAJ-uh-stee) which means an attack on any custom, institution, belief, held sacred or revered by numbers of people. It is not very often that there is a transparent connection between French (and English) and Latin, but lese majesty is such a term. In modern French the term is lèse-majesté, from Middle French laise majeste “a crime against the king, treason.” The French forms derive from Latin laesa mājestās “injured majesty. Lese majesty entered English in the 15th century. Birthdays: Duane Mooney, Nick Spanhak and Greyson Martell. Happy Birthday to each of them and, and if we missed you on the list―Happy Birthday to you, too, from all of us at W-V-B-I and Beaver Island Community Center. That’s the W-V-B-I Community Calendar for Wednesday, April 17th, 2019. Today is Tuesday, April 16th, 2019. I’m Kevin Boyle, with today’s W-V-B-I Community Calendar. Beaver Islander made its first trip of the season yesterday, heading out into an ice strewn Lake Michigan with students at our Community School given them a send-off with their Monday Flag Ceremony at the Public Beach. Now, here’s what’s happening on your Emerald Isle … Today, Pickleball here at the BIC Center from 9:30 to 11:30. Also, Arthritis Foundation Exercise Program from 10 to 11 Friday up in Carol’s Hangout upstairs here at the BIC Center. This evening, Telecommunications Advisory Committee meets in the conference room at school at 5. Also this evening, Ladies Shuffle Board at the Shamrock. That’ll be wrapping up soon for the season, so don’t miss your chance to join in the fun. Wednesday, Talking Threads Quilt Guild will be chatting at Peaine Township hall at 9:30. That’s probably getting ready to wrap up for the season, too. Also tomorrow across, there’s a special Charlevoix Chamber event featuring Beaver Island. Chamber President Paul Cole will be there along with others to represent the island. You can head over, too, to help fly the flag. Just ask Paul about it with a call to the Chamber at 2505. Thursday, more Pickleball here at the BIC Center from 9:30 to 11:30. Also, Games Galore form 1 to 4 up in Carol’s Hangout. Thursday evening the library board meets at the library at 7 And the Euchre Board meets at Stoney, also at 7. And, the Discover Beaver Island group—a Chamber project to promote the island—is meeting at Peaine Township Hall at 5. Friday, it’s a half day of school for students at B-I-C-S. Arthritis Foundation Exercise Program is here at the BIC Center from 10 to 11. And its Good Friday. Information on services is on the calendar. And, while we are talking about good things to eat, be sure to put the upcoming Shakespeare Spaghetti dinner on your calendar. It’s on the 23rd at school. The B-I-C-S A-P English is putting it on as a dinner fundraiser. All you can eat—again on April 23rd from 5:30 to 7. Your free-will donation will help support their trip to England where they plan to continue their study of Shakespeare with a visit to the Globe Theater, museums and more. Today A chance of showers between 10am and 11am. Mostly cloudy, with a high near 47. East wind around 5 mph. Chance of precipitation is 30%. Tonight Partly cloudy, with a low around 33. East wind around 5 mph. Wednesday A 30 percent chance of showers after 2pm. Mostly cloudy, with a high near 46. East wind 10 to 15 mph. Wednesday Night Showers, mainly after 8pm. Low around 38. East wind around 15 mph, with gusts as high as 25 mph. Chance of precipitation is 90%. Thursday Showers likely. Cloudy, with a high near 46. South wind around 10 mph becoming west in the morning. Chance of precipitation is 60%. Thursday Night A 50 percent chance of showers before 2am. Cloudy, with a low around 36. TRAFFIC: No delays inbound or outbound to the airports, beltway running smoothly. West Side drive got a great grooming from the road crew teams yesterday. Smooth as a babby’s bottom. OK A Beaver Babby, but still pretty smooth for a dirt road. Syill, high water here and there continues–and ruts and boggy spots that can sneak up on you with everything else so smooth. So let’s be careful out there. Especially in the school zone. ON THIS DATE in 1881, on the streets of Dodge City, famous western lawman and gunfighter Bat Masterson fights the last gun battle of his life. Bartholomew “Bat” Masterson had made a living with his gun from a young age, first as a buffalo hunter, operating out of the wild Kansas cattle town of Dodge City, then as an army scout in the Plains Indian Wars. After a gunfight where he luckliy avoid charges after killing a man, he became an officer of the law. For the next five years, Masterson alternated between work as Dodge City sheriff and running saloons and gambling houses, gaining a reputation as a tough and reliable lawman. In 1881, news that his younger brother, Jim, was in trouble back in Dodge City reached Masterson in Tombstone, Arizona. Masterson immediately took a train to Dodge City. When his train pulled into Dodge City on this morning in 1881, Masterson wasted no time. He quickly spotted Peacock and Updegraff and a gunfight ensued. No one was mortally injured in the melee, and since the shootout had been fought fairly by the Dodge City standards of the day, no serious charges were imposed against Masterson. He paid an $8 fine and took the train out of Dodge City that evening. DID YOU KNOW: the longest time between two twins being born is 87 days? WORD OF THE DAY: umami (oo-MAH-mee) which means a strong meaty taste, often considered to be one of the basic taste sensations along with sweet, sour, bitter, and salty, imparted by glutamate and certain other amino acids. Umami comes unchanged from Japanese umami “savory taste, delicious taste.” Umami comes from umi-, the inflectional stem of umai “(to be) delicious” and -mi, a suffix forming abstract nouns from adjectives. Umami entered English in the 20th century. Birthdays: Satch Wierenga, Mackenzie Cole, and Kimberly Read. Happy Birthday to each of them and, and if we missed you on the list—Happy Birthday to you, too, from all of us at W-V-B-I and Beaver Island Community Center. If I’ve told you N times, I’ve told you N plus one times. That’s the W-V-B-I Community Calendar for Tuesday, April 16th, 2019. Today is Monday, April 15th, 2019. I’m Kevin Boyle, with today’s W-V-B-I Community Calendar. Spring is finally here. The emerald Isle has sailed out of the harbor for its first trip across of the season. She left right on time at 8:20 and headed out onto the lake through a reasonably clear Paradise Bay. Tomorrow, Pickleball here at the BIC Center from 9:30 to 11:30. Also, Arthritis Foundation Exercise Program from 10 to 11 Friday up in Carol’s Hangout upstairs here at the BIC Center. Tuesday evening, Telecommunications Advisory Committee meets in the conference room at school at 5. Also Tuesday evening, Ladies Shuffle Board at the Shamrock. That’ll be wrapping up soon for the season, so don’t miss your chance to join in the fun. Wednesday, Talking Threads Quilt Guild will be chatting at Peaine Township hall at 9:30. That’s probably getting ready to wrap up for the season, too. Thursday, more Pickleball here at the BIC Center from 9:30 to 11:30. Also, Games Galore form 1 to 4 up in Carol;s Hangout. Thursday evening the library board meets at the library at 7 And the Euchre Board meets at Stoney, also at 7. They, too, are getting ready to wrap up for the season. Weather, here there and everywhere – presented every day with the support of the good folks down at McDonough’s Market: Today Sunny, with a high near 46. North wind 5 to 10 mph becoming west in the afternoon. Tonight Increasing clouds, with a low around 33. Southwest wind around 5 mph. Tuesday Mostly cloudy, with a high near 46. Southeast wind around 5 mph. Tuesday Night Partly cloudy, with a low around 33. East wind around 5 mph. Wednesday A 50 percent chance of showers after 2pm. Partly sunny, with a high near 46. East wind 10 to 15 mph. Wednesday Night Showers, mainly after 8pm. Low around 38. Breezy. Chance of precipitation is 80%. TRAFFIC: No delays inbound or outbound to the airports, beltway running smoothly. But hgh water here and there as the thaw continues and ruts and boggy spots. So let’s be careful out there. Especially in the school zone. Time now for a look at Phyllis’s Facebook posts… ON THIS DATE in 1947, Jackie Robinson, age 28, becomes the first African-American player in Major League Baseball when he steps onto Ebbets Field in Brooklyn to compete for the Brooklyn Dodgers. Robinson broke the color barrier in a sport that had been segregated for more than 50 years. Exactly 50 years later, on April 15, 1997, Robinson’s groundbreaking career was honored and his uniform number, 42, was retired from Major League Baseball by Commissioner Bud Selig in a ceremony attended by over 50,000 fans at New York City’s Shea Stadium. Robinson’s was the first-ever number retired by all teams in the league. DID YOU KNOW: a dime as 118 ridges around the edge? Go ahead. Count them. We’ll wait. WORD OF THE DAY: gabelle (guh-BEL) which means a tax; excise. The rare noun gabelle “a tax on salt” comes from Anglo-French (the variety of French used in England after the Norman Conquest) and other Romance languages and dialects from Late and Medieval Latin gabella “tax, salt tax.” Gabella derives ultimately from Arabic qabāla “tax, duty, impost.” There is an understandable confusion in form and meaning between gabelle “a tax on salt,” and gavel “feudal rent, tribute to a superior.” Gavel comes from Old English gafol, a noun that dates from about 725, occurs only in Old English, and derives from the same Germanic root as the verb give. Gabelle entered English in the 15th century. Birthdays: Glen LaFreniere and Sanomalyn Naranjo. Happy Birthday to each of them and, and if we missed you on the list—Happy Birthday to you, too, from all of us at W-V-B-I and Beaver Island Community Center. What kind of weather do cupcakes like? That’s the W-V-B-I Community Calendar for Monday, April 15th, 2019. DATE: April 12, 2019 TIME: 18:00 Today is Friday, April 12th, 2019. I’m Kevin Boyle, with your W-V-B-I Weekend Community Calendar. The Steve and Elaine West say they’ve sold the Northern Islander to islander Cynthia Johnson. The deal will close on July 1. Until then, Steve and Elaine will work with Cynthia on publishing the monthly paper so there is a smooth transition. Elaine says she is confident that Cynthia will do an outstanding job as the Northern Islander’s editor and publisher. Cynthia, host of the Top Ten plus Five here on W-V-B-I says she plans to create a local newspaper each month that we can all be proud of. As for Steve and Elaine…after 20 year sof publishing the Northern Islander, they are heading off to Camden, South Carolina-but plan to be regular visitors to the island. In other news, Word is that dental services should be starting up at the health center around the middle of May-ending a long stretch with no dental services on the island. You can sign up by calling Dental North at 800 432 4121. The new equipment in the dental center is all ready to go. Lego Club Saturday at the Library at 1. Self-defense class at Peaine Township hall at 5. Also Saturday, two great feature films at the BIC Center: Bumblebee is at 4, rated P-G 13. And at 7, it’s The Mule staring and directed by Clint Eastwood. It’s critically acclaimed. Rated R. Both movies on the big screen with the big sound in the McDonough’s Market Theater. Concession stand will be open for both movies. Popcorn, pretzels, sweets, Nathan’s hotdogs with chips and pop from the soda fountain. On Sunday, worship services at Holy Cross, the Christian Church and the Lighthouse Fellowship. Details are on the calendar. After church, C-O-A dinner at the community school from 11 to 1. On the menu is meatloaf, mashed potatoes and more. Kathie says she needs some volunteers to help with meal service. You can sign up with a call to 2124. Easter Brunch will be served on Easter Sunday at Gregg Fellowship Center at 11:30. All your brunch favorites with all your favorite island friends. It’s a great way to celebrate the day. Free-will donation. Come as you are. And, just a few days after that on the 23rd, the B-I-C-S A-P English class has a dinner fundraiser. It’s spaghetti-all you can eat-again on April 23rd from 5:30 to 7. Your free-will donation will help support their trip to England where they plan to continue their study of Shakespeare with a visit to the Globe Theater, museums and more. Speaking of plays, we have a great one comin gup here at the BIC Center-the first performance of our 2019 season. It’s ‘Til Beth Do Us Part presented by the Beaver Island Community Players on April 27th at 8 and the 28th at 3. Tickets are on sale now at the BIC Center front desk or with a call to 2022. Weather, here there and everywhere – presented every day with the support of the good folks down at McDonough’s Market: Tonight A slight chance of rain showers after 8pm, mixing with snow after 4am. Mostly cloudy, with a low around 34. Windy, with a southwest wind 25 to 30 mph, with gusts as high as 45 mph. Saturday Mostly cloudy, with a high near 42. Breezy, with a southwest wind 20 to 25 mph, with gusts as high as 40 mph. Saturday Night Mostly cloudy, with a low around 27. West wind 5 to 10 mph becoming north after midnight. Sunday Partly sunny, with a high near 40. Northeast wind 5 to 15 mph. Sunday Night A chance of rain showers, mixing with snow after 9pm, then gradually ending. Mostly cloudy, with a low around 31. Monday Mostly sunny, with a high near 45. Monday Night Partly cloudy, with a low around 31. Birthdays: Dereck McDonough, John Albin, Kevin McDonough and Jimmy Kenwabikise. Happy Birthday to each of them and, and if we missed you on the list-Happy Birthday to you, too, from all of us at W-V-B-I and Beaver Island Community Center. What is the difference between Justin Bieber and a unicorn? That’s the W-V-B-I Community Calendar for Friday, April 12th, 2019. I’m Kevin Boyle at the pest free Hogarth Pest Control Studios of the Voice of Beaver Island wishing you a great weekend and asking you: why not make it the best one ever? And, thanks for listening. DATE: April 12, 2019 Today is Friday, April 12th, 2019. I’m Kevin Boyle, with today’s W-V-B-I Community Calendar. The Steve and Elaine West say they’ve sold the Northern Islander to islander Cynthia Johnson. The deal will close on July 1. Until then, Steve and Elaine will work with Cynthia on publishing the monthly paper so there is a smooth transition. Elaine says she is confident that Cynthia will do an outstanding job as the Northern Islander’s editor and publisher. Cynthia, host of the Top Ten plus Five here on W-V-B-I says she plans to create a local newspaper each month that we can all be proud of. As for Steve and Elaine…after 20 year sof publishing the Northern Islander, they are heading off to Camden, South Carolina—but plan to be regular visitors to the island. In other news, Word is that dental services should be starting up at the health center around the middle of May—ending a long stretch with no dental services on the island. You can sign up by calling Dental North at 800 432 4121. The new equipment in the dental center is all ready to go. Thanks again to Pam for all she does to fight off the invasives. Today, Arthritis Foundation Exercise Program from 10 to 11 Friday up in Carol’s Hangout here at the BIC Center. And, B-I Fit is open for your work out over at the school. Find out about hours and sign up in the school office. Here’s what’s up for the weekend: Lego Club Saturday at the Library at 1. Self-defense class at Peaine Township hall at 5. Also Saturday, two great feature films at the BIC Center: Bumblebee is at 4, rated P-G 13. And at 7, it’s The Mule staring and directed by Clint Eastwood. It’s critically acclaimed. Rated R. Both movies on the big screen with the big sound in the McDonough’s Market Theater. Concession stand will be open for both movies. Popcorn, pretzels, sweets, Nathan’s hotdogs with chips and pop from the soda fountain. And, just a few days after that on the 23rd, the B-I-C-S A-P English class has a dinner fundraiser. It’s spaghetti—all you can eat—again on April 23rd from 5:30 to 7. Your free-will donation will help support their trip to England where they plan to continue their study of Shakespeare with a visit to the Globe Theater, museums and more. Weather, here there and everywhere – presented every day with the support of the good folks down at McDonough’s Market: Today Snow before 2pm, then snow, possibly mixed with freezing rain. High near 32. Breezy, with an east wind 15 to 20 mph increasing to 20 to 25 mph in the afternoon. Winds could gust as high as 35 mph. Total daytime ice accumulation of less than a 0.1 of an inch possible. Total daytime snow accumulation of around an inch possible. Tonight A chance of more snow, freezing rain, and sleet before 11pm, then rain. Some thunder is also possible. And, if that’s not enough variety for you…Patchy fog after 9pm. Temperature rising to around 35 by midnight. Windy, with an east wind around 30 mph, with gusts as high as 50 mph. New ice accumulation of less than a 0.1 of an inch possible. New snow and sleet accumulation of less than a half inch possible. Friday Rain, mainly before 2pm. Patchy fog before 9am. High near 43. Breezy, with an east wind 15 to 20 mph becoming southwest in the afternoon. Winds could gust as high as 30 mph. Friday Night Mostly cloudy, with a low around 34. Breezy, with a southwest wind 20 to 25 mph, with gusts as high as 40 mph. Saturday A 30 percent chance of showers after 3pm. Mostly cloudy, with a high near 40. Breezy, with a southwest wind 15 to 20 mph, with gusts as high as 30 mph. Saturday Night A chance of showers before 9pm. Mostly cloudy, with a low around 28. Sunday A 40 percent chance of showers after 3pm. Partly sunny, with a high near 41. Sunday Night A chance of rain showers before 11pm, then a chance of rain and snow showers. Cloudy, with a low around 32. DID YOU KNOW: one out of five people in the world (1.1 billion people) live on less than $1 per day? WORD OF THE DAY: alacrity (uh-LAK-ri-tee) which means cheerful readiness, promptness, or willingness. Alacrity comes from Middle French alacrite from Latin alacritāt-, the stem of alacritās “liveliness, zeal, enthusiasm.” Alacritās is a derivative noun of the adjective alacer “nimble, brisk, enthusiastic, keen.” Latin alacer develops into Italian allegro and Spanish alegre “cheerful, happy.” Alacrity entered English in the 15th century. Birthdays: Bailey McDonough, Sue Erber, Melissa Mcoffell and Kyle Marvin. Happy Birthday to each of them and, and if we missed you on the list—Happy Birthday to you, too, from all of us at W-V-B-I and Beaver Island Community Center. Don’t forget about the PABI Ice Classic going on right now. Things are starting to look a little sketchy for the buoy right now. 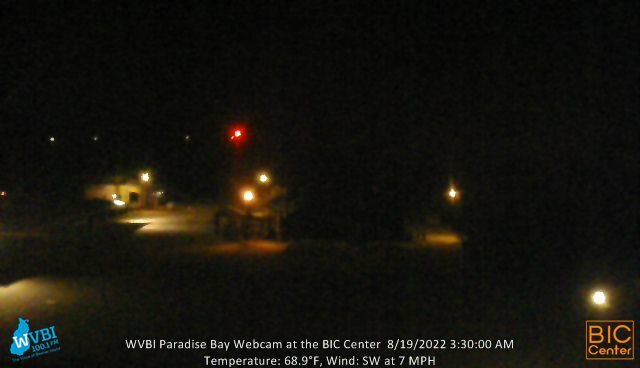 Check it out yourself on the WVBI Hodgson Enterprises webcam from high atop the BIC Center. It’s at the bottom of our web site. If you enter the PABi Ice Classic and make the best prediction of when the buoy goes through the ice—you’ll take home half the entry fees—other half goes to support your community radio station and your community Center. You can buy your entry here at the BIC Center. Details and rules are available at bic center dot org. Just click the Ice Classic menu at the top. Today is Tuesday, April 9th, 2019. I’m Kevin Boyle, with today’s W-V-B-I Community Calendar. Exercise planner for the week: Today and Thursday, Pickleball at the BIC Center from 9:30 to 11:30. Arthritis Foundation Exercise Program is here, too, from 10 to 11 today and Friday up in Carol’s Hangout. Saturday night, Self defense class at Peaine Township hall at 5. And, B-I Fit is all week over at the school. Sign up if you haven’t already in the school office. Meeting planner for the week is easy. There was a BICS school board meeting last week, but that’s it. No more this week. Fun planner for the week: Ladies Shuffleboard tonight at the Shamrock at 7. Talking Threads Quilt Guild Wednesday morning at 9:30 at Peaine Township Hall. Euchre Thursday evening at Stoney at 7. Lego Club Saturday at the Library at 1. Also Saturday, two great feature films at the BIC Center: Bumblebee is at 4, rated P-G 13. And at 7, it’s The Mule staring and directed by Clint Eastwood. It’s critically acclaimed. Rated R. Both movies on the big screen with the big sound in the McDonough’s Market Theater. Concession stand will be open for both movies. Popcorn, pretzels, sweets, Nathan’s hotdogs with chips and pop from the soda fountain. If you are looking for a job this summer, just about everyone is looking for you. McDonoughs, all the restaurants, the hardware and Island Airways all looking. Weather, here there and everywhere – presented every day with the support of the good folks down at McDonough’s Market: Today A chance of rain and snow showers before 11am, then a chance of rain showers after 1pm. Patchy fog before 10am. Otherwise, cloudy, with a high near 40. Northwest wind 10 to 15 mph. Tonight A chance of rain showers, mixing with snow after 7pm, then gradually ending. Cloudy during the early evening, then gradual clearing, with a low around 27. Northwest wind 10 to 15 mph, with gusts as high as 25 mph. Wednesday Mostly sunny, with a high near 39. Northeast wind 5 to 10 mph. Wednesday Night Increasing clouds, with a low around 28. East wind 10 to 15 mph. Thursday Rain and snow likely before 4pm, then rain likely between 4pm and 5pm, then rain, snow, and freezing rain likely after 5pm. Cloudy, with a high near 36. Breezy, with an east wind 15 to 25 mph, with gusts as high as 45 mph. New snow accumulation of around an inch possible. Don’t fret about that. The forecast in the U-P is for 5 to 10 inches. Thursday Night Freezing rain before 1am, then rain. Low around 32. Breezy. Time now for a look at Phyllis’s Facebook posts… ON THIS DATE in 1939, more than 75,000 people come to the Lincoln Memorial in Washington, D.C., to hear famed African-American contralto Marian Anderson give a free open-air concert. Anderson had been scheduled to sing at Washington’s Constitution Hall, but the Daughters of the American Revolution, a political organization that helped manage the concert hall, denied her the right to perform because of her race. The first lady, Eleanor Roosevelt, resigned her membership from the organization in protest, and Anderson’s alternate performance at the Lincoln Memorial served greatly to raise awareness of the problem of racial discrimination in America. Even after her dramatic appearance at the Lincoln Memorial in 1939, it was not until 1955 that she became the first African-American to be invited to perform at New York’s Metropolitan Opera House. Three years later, President Dwight D. Eisenhower made her an honorary delegate to the United Nations, and in 1963 President John F. Kennedy awarded her the Presidential Medal of Freedom. Anderson died in Portland, Oregon, on April 8, 1993. She was 96 years old. DID YOU KNOW: in the United States, a pound of potato chips costs two hundred times more than a pound of potatoes. WORD OF THE DAY: polysemy (POL-ee-see-mee, puh-LIS-uh-mee) which means a condition in which a single word, phrase, or concept has more than one meaning or connotation. Fast can mean “moving quickly” or “firmly fixed.” The word shows polysemy, which ultimately derives from Greek polýsēmos “having many meanings.” Polýsēmos joins polýs “many, much,” and sêma “sign, mark, token.” In linguistics, polysemy and semantics were modeled on French polysémie and sémantique. These words were formed in the late 19th century by French linguist Michel Bréal (1832–1915)—a man perhaps better remembered for inspiring the modern Olympic marathon in 1896. Polysemy entered English in the 1920s. Birthdays: Kathy Speck is celebrating today. Happy Birthday to Kathy, and if we missed you on the list—Happy Birthday to you, too, from all of us at W-V-B-I and Beaver Island Community Center. That ice classic buoy seems to be holding its own for now out there. If you enter the PABi Ice Classic and make the best prediction of when the buoy goes through the ice—you’ll take home half the entry fees—other half goes to support your community radio station and your community Center. You can buy your entry here at the BIC Center. Details and rules are available at bic center dot org. Just click the Ice Classic menu at the top. Here’s a thought for the day from Marion Anderson: When you stop having dreams and ideals – well, you might as well stop altogether. Why kind of shorts do clouds wear? Thunderwear. That’s the W-V-B-I Community Calendar for Tuesday, April 9th, 2019.